and a Happy (belated) Girls’ Day! March the third was Girls’ Day in Japan and as I said in my previous post, the occasion is marked by elaborate displays of dolls representing the Emperor and Empress and in the most elaborate displays, their full court of attendants on a graduated dais covered in red felt. 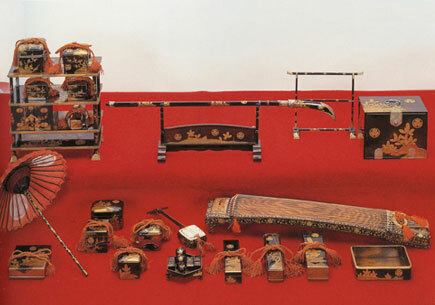 A full set of dolls displayed by a wealthy family might appear similar to that shown below. In a time when marriage was a woman’s only option, such displays were thought to encourage the daughter to aspire to a prosperous match. On Boys’ Day, celebrated in early May, helmets, armor and warrior dolls were displayed to encourage young boys to see the glories of military service as a man’s duty. Since Hina dolls have been displayed annually for so many centuries, the historical collections of dolls being displayed in museums this month are a doll lover’s dream. 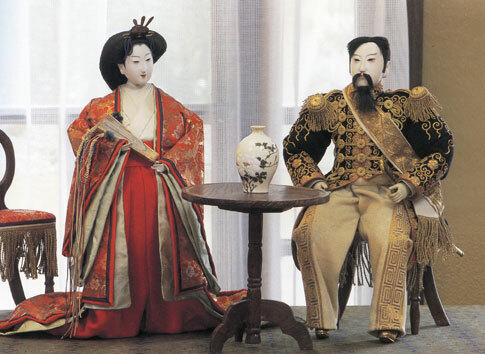 While I’m not certain of the age of the pair of dolls shown below, the elaborate padded costumes are a beautiful contrast to the simplified faces. Of course, not all families could afford the most elaborate displays and so these simplified dolls also developed. Details such as the hat, hair and tassels were added to the carved and painted wooden base. 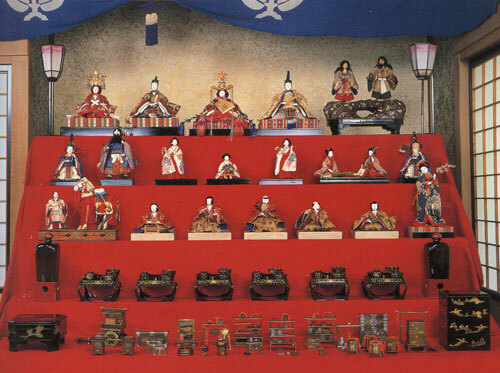 A display of dolls like these might have been accompanied by a flower arrangement or hanging scroll, but carried no less fervent desire for their daughter’s successful future. 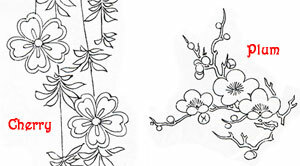 Note that the plum blossom theme has been incorporated in the painted decorations. 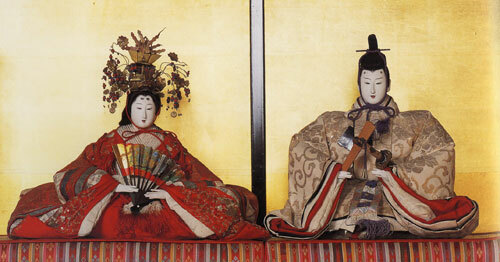 This pair of dolls dates from the Meiji period (1868-1912), when Japan emerged from feudal society to the modern era. Although Japan had previously imposed limits on contact with foreign governments and cultures, Commodore Perry backed by the US Navy had successfully demanded the opening of Japan in 1853. In the years that followed, Japan underwent enormous social and cultural changes and these were even reflected in the Hina dolls of that period. 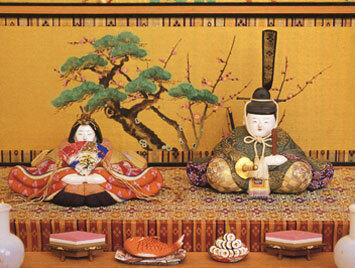 Although the Empress remains in classical kimono, the Emperor doll is shown in western dress and the surrounding display elements mimic the western furniture being newly introduced at that time. Subsequently though, dolls reverted to a more traditional appearance and the sets currently on sale in department stores appear much more similar to the set shown at the top of the post. But some displays have taken a very creative approach to replacing the red felt covered dais, as in this boating display shown below. Note that they’ve managed to include a few branches of plum blossoms in the background of the display. Still others have taken a more humorous approach as with these chubby little dolls. Although there are no courtiers in this set, there is an offering of fish, a plate of rice balls and other props to help create that sense of prosperity. Note that the painted backdrop features a combination of pine trees and plum blossoms. For those who can afford the most elaborate displays, as well as dedicated collectors, there are numerous precious details to choose from—miniscule dishes, tiny lacquered storage boxes and a whole range of precisely scaled musical instruments. There are even sets of tiny dog dolls to romp through the royal court. 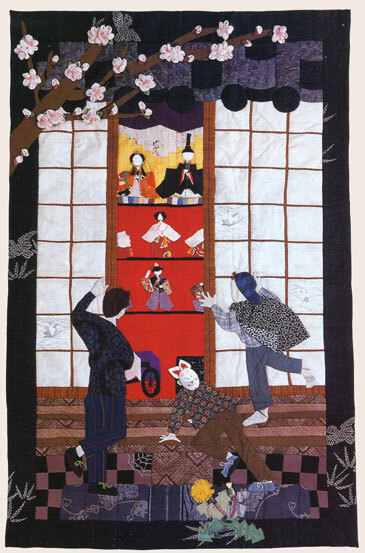 With such a rich tradition, Hina Matsuri has also become a theme for modern Japanese art quilts. Two such quilts are shown below. The first focuses on the family joy in setting up the annual display. Note again the plum blossoms in the upper corner of the quilt. 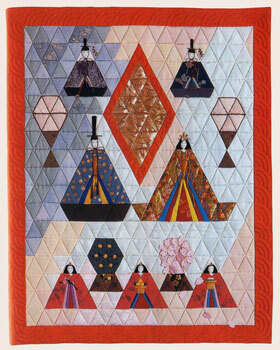 These were beautifully done in 3D, adding great dimensional presence to the quilt. While the image in this small quilt hanging is heavily abstracted, it retains the much more formal qualities of a full display of dolls. So for those of you with daughters, March is a month to give her especially big hugs. And even though women’s options have grown exponentially (thank goodness! ), tell her how much you want the absolute best for her. This entry was posted in holidays, kimono, Kyoto living on March 20, 2009 by admin. 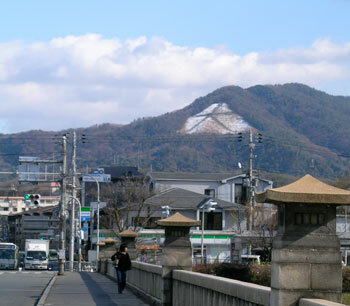 Though it was frequently freezing cold, winter in Kyoto was relatively snowless this year. We usually get at least one good snow storm, but this year we were limited to a few snow flurries and a lovely dusting of the great “dai” symbol on the mountain slope overlooking the east side of the city. Known as “daimonji”, it is one of the iconic images associated with Kyoto. The symbol is carved by carefully controlled bonfires set on August 16th of each year to celebrate the end of O-bon. A total of five such bonfires are set on different mountain sites encircling the city and the visual effect of this summer festival is magical. Daimonji is the most easily visible from several vantage points throughout the city and its iconic presence remains just as potent even in the throes of winter. But winter has never been my favorite season, and I must confess delight in feeling the weather pass into spring. Earliest of the spring signs, I found these plum trees blossoming in the garden of Shokokuji temple last week. Starting in mid to late February, Kyoto is blessed with plum blossoms ranging from pale pink through deeper shades of rose and even red. The flowers shown at left are the pale pink variety and from a distance may appear much like cherry blossoms, but those won’t bloom until April. In Japanese art, even the most stylized representations of plum and cherry blossoms can be easily distinguished by a dimple at the outer edge of the cherry blossom petal, whereas plum blossoms have fully rounded petals. 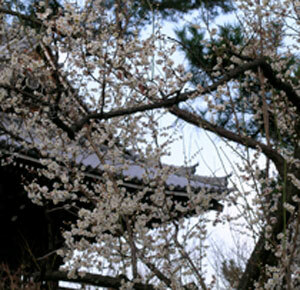 And though it may seem surprising, plum blossoms are considered more feminine. This association comes from the plum’s ability to bloom against the adversity of winter, a subtle acknowledgement of the social constraints that often make the lives of Japanese women difficult. Cherry blossoms, on the other hand, were associated with the samurai warriors, who adopted cherry blossoms as their symbol of the brief but glorious life of a soldier slain honorably in battle. Of course, the Japanese love of cherry blossoms is legendary, but the beautiful plum blossom, loved for both its seasonality and representation of femininity, is also loved for its association with Hina Matsuri. 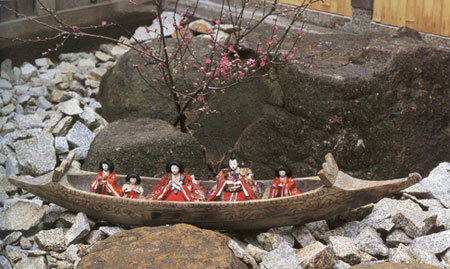 Popularly known as Girl’s Day, Hina Matsuri is celebrated on March 3rd. 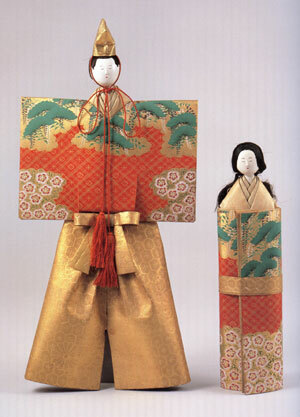 Though in earlier times, the third day of the third month was a purification festival, the form of celebration changed during the Muromachi period (1333-1573 AD) and has continued since that time to involve an elaborate display of dolls. The styles of dolls have evolved over the centuries and many public displays of historical doll retrospectives will be on view this month. 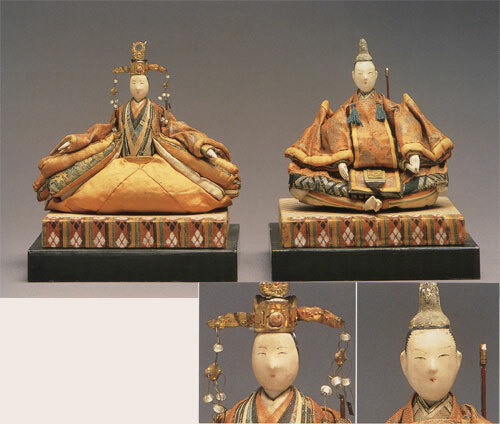 Among my personal favorites are the dairi bina (Emperor and Empress dolls), such as the pair shown below. All in all, I expect March will be a glorious month gliding ever futher into spring. This entry was posted in holidays, Kyoto living on March 1, 2009 by admin.